Semi Automatic Fly Ash Brick Making Machine has become one of the prime options of every manufacturing sector to develop unmatched quality fly ash bricks with the production capacity of 5,500 Pcs in 8 Hrs. The range is designed with high compressive strength to offer excellent thermal insulation features. 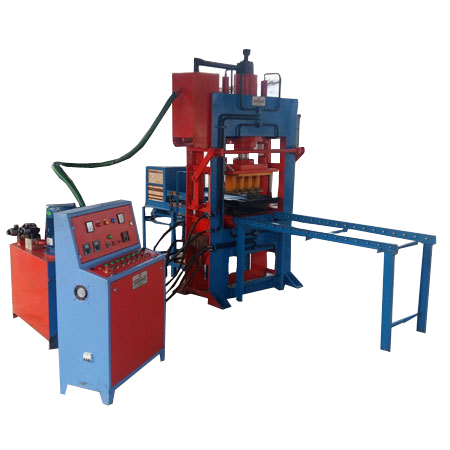 With this advanced technology machine, you can get environment friendly fly ash bricks at very lowest prices. The machine is designed to provide efficient and fast formation process of bricks that can make big savings of yours in concrete material prices. With increased density as well as strengthening action, the array provides the best performance. The produced bricks ensure high fire insulation, strength and no breakage. In addition to this, you can get uniformly sized end product with lower water penetration seepage. This low cost, power saving and maintenance proof machine is sure to provide you with the high savings and maximum efficacy. 5,500 Pcs in 8 Hrs. Labour Required 7 to 8 Persons.